A graph shows the water levels at White Bear Lake in east central Minnesota have been dropping steadily since 2003. Graph: Minnesota Department of Natural Resources Lake Finder database. 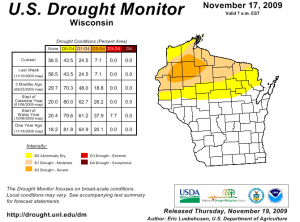 Dry weather has caused water levels to drop in some inland lakes in Minnesota and Wisconsin. Some lakes have dropped more than five feet in east central Minnesota due to a two-year dry spell, said Sandy Fecht, a hydrologist with the Minnesota Department of Natural Resources. Certain bodies of water have dried up completely. Volunteers monitor about 1,000 lakes with gauges about once a year. The information is catalogued into a Lake Finder database, which shows water drops in Central Lake and White Bear Lake, both in the east central part of the state. North Central Lake lost more than six feet of water since 2003 and has reached its lowest water levels in 43 years of monitoring, Fecht said. White Bear Lake, which has been monitored for 85 years, dropped more than five feet since June 2003. The average annual water fluctuation is only one to two feet. “White Bear is especially susceptible to dry conditions because it interacts closely with groundwater and the level of the lake reflects the condition of the groundwater aquifer,” Fecht said. But the condition is not uniform. In the Northwest part of the state, excessive rain has had the opposite effect. “Those lakes are at some of their highest levels,” Fecht said. Just south of Minnesota, the top third of Wisconsin has been getting drier for the past 10 to 20 years, said Tim Asplund, a lake expert with the Wisconsin Department of Natural Resources. “It’s really been noticeable in the last three to four summers,” he said. Anvil lake, a shallow lake in the northeast part of the state, is at an all time low, Asplund said. Cycles of drought are common for lakes, but the water levels usually rebound. “With Anvil, you see cycles, but it never quite gets back up where it used to be,” he said. Climate change could be playing a part, Asplund said. Climate change models call for more rain from big storms in the Midwest. “But if you get a lot of rain in big storms, it could end up running off instead of seeping through to maintain water levels,” he said. Low water levels can kill aquatic plants with negative consequences. Lake vegetation provides bottom stability, protects the shoreline from wave erosion and stores nutrients, said Steve Enger, coordinator of the aquatic plant management program, a division of the Minnesota Department of Natural Resources. In Minnesota, some landowners are tempted to clear the vegetation, which is against state law, he said. Low lake levels can also disrupt fish habitats and make way for invasive aquatic plants. 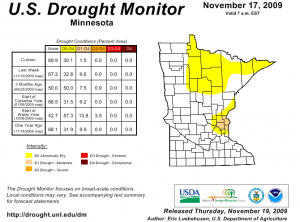 Conditions are starting to improve in Minnesota, according to state resource officials United States Drought Monitor maps for the state show a shrinking area of drought conditions. The state is also seeing more rainfall in the south.